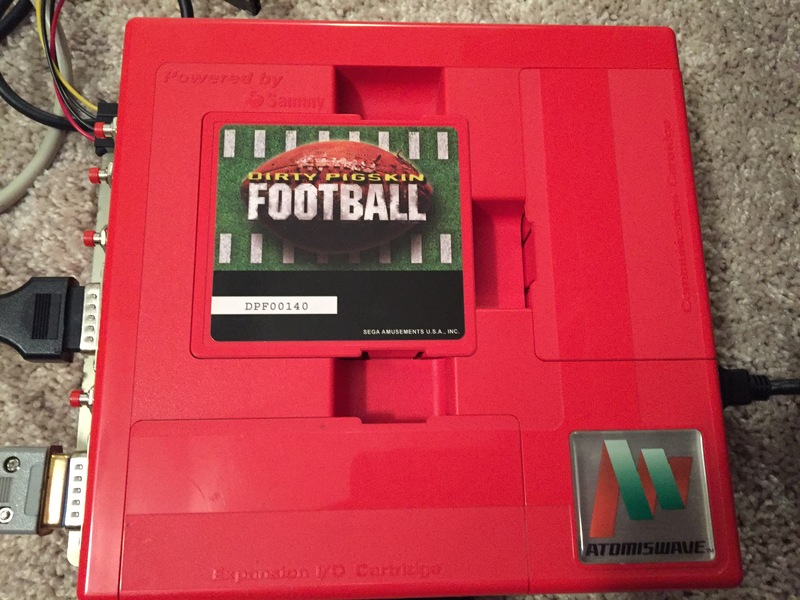 Note: This game was played in a consolized Sammy Atomiswave that has been modified to output via an HDMI port. The game was played in a 39-inch HD tv using a Neo Geo controller. 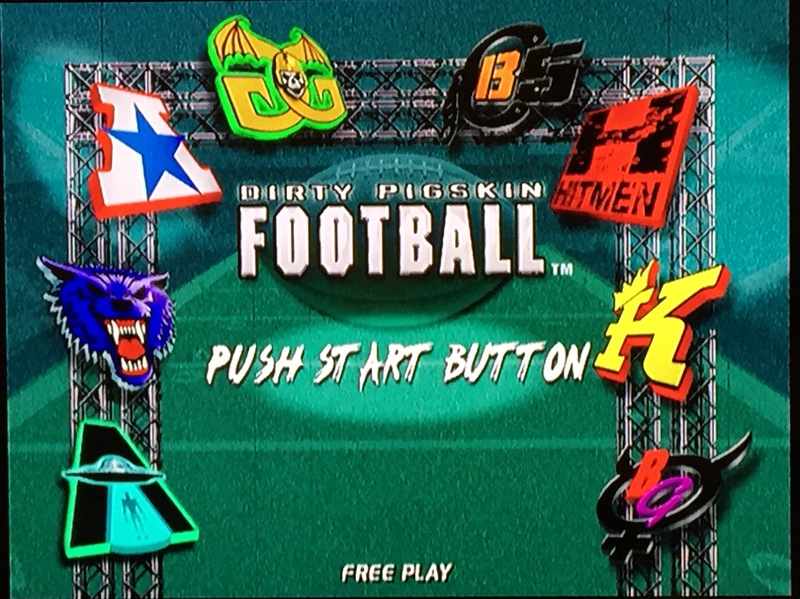 Overview: Dirty Pigskin Football was released for the Sammy Atomiswave arcade cabinet in 2004. Evidently, some of the dedicated arcade cabinets had their own unique ‘football’ styled joysticks, making for a unique playing experience. Players: *2, co-op or competitive. 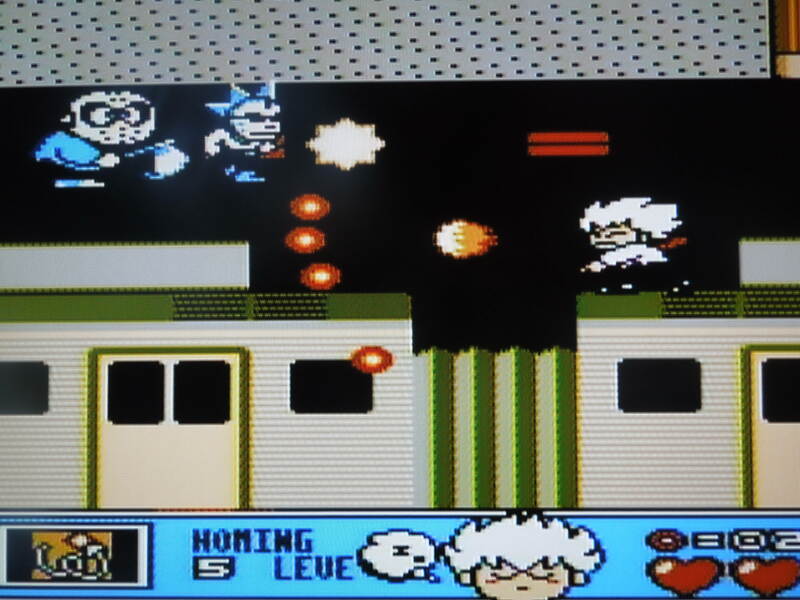 In the system menu, under Game Settings, the game can be set up for 4 players. Originally, depending on the arcade cabinet the Atomiswave motherboard was set up in, arcade owners had the option to select 2 or 4 players based on how many players their machine could accommodate. My consolized Atomiswave only has 2 controller ports; therefore, I keep the setting for 2 players only. Rules: 5 on 5 Football. Each game is 3:00 minutes long. Ties are possible, and there is no overtime. There is no kicking of any kind in the game – each team starts their possession on their own 20 yard line, and has 4 downs to score a touchdown, or the ball is turned over on downs. There are no penalties of any kind. Season: Play a 5 game season. The first 4 games are the regular season. 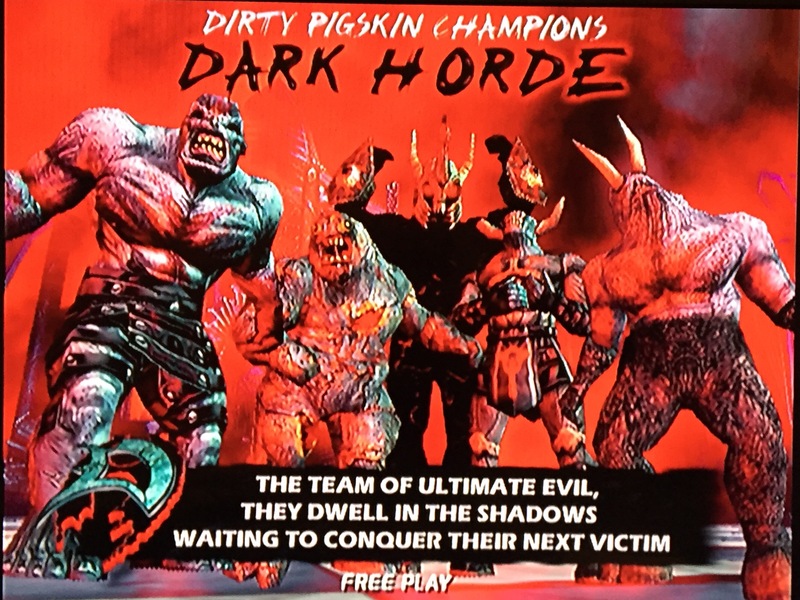 Depending on your record, you’ll get a championship game against one of four possible opponents: a Mirror Match vs. your own team, the Hall of Fame (a mix of players from several of the teams), HardKor (a cyborg team), and the Dark Horde (a demonic football team). Scoring: 7 points for a passing touchdown, 6 points for a rushing touchdown. 2 points for a safety. 7 points for an interception returned for a touchdown (Pick 7?!). Remember, there is no kicking PATs or field goals. Controls: 3 action buttons are used. They are color-coded on the playscreen. Essentially, on your controller, red is button 1, blue is button 2, and yellow is button 3. 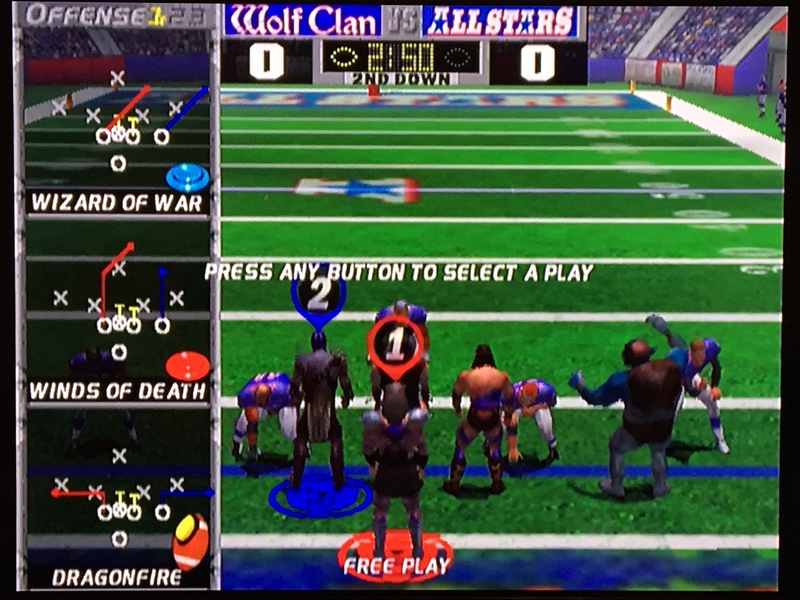 On offense, you press button 1, 2, or 3 to select a play (9 to choose from for each team, although only 3 appear onscreen at a time – scroll right or left to see the other plays) and button 1 also snaps the ball. Once snapped, you can press button 1 or button 2 to pass to the red or blue highlighted receiver. Button 3 activates your ‘turbo’ – your QB (or receiver if you passed) will speed up if held until your meter is depleted. On defense, button 1 tackles the ball carrier, and button 2 switches which of the 5 players in your team you are. Will you cover a receiver as a Corner or go for the sack as a Linebacker? Advanced Defense Controls: On defense, wiggling the joystick will help you get off blocks to try and sack the QB or pursue a ball carrier. Pressing button 1+ button 3 executes a ‘Super Tackle’ if you are close to the ball carrier. This is a special move that has its own animation and stops the ball carrier right in his or her tracks. You can only execute a Super Tackle if your meter is completely full and reads SUPER and you’re near the ball carrier. Advanced Offense Controls: Button 1 + Button 2 spins your runner. Button 2 + button 3 delivers a stiff arm. 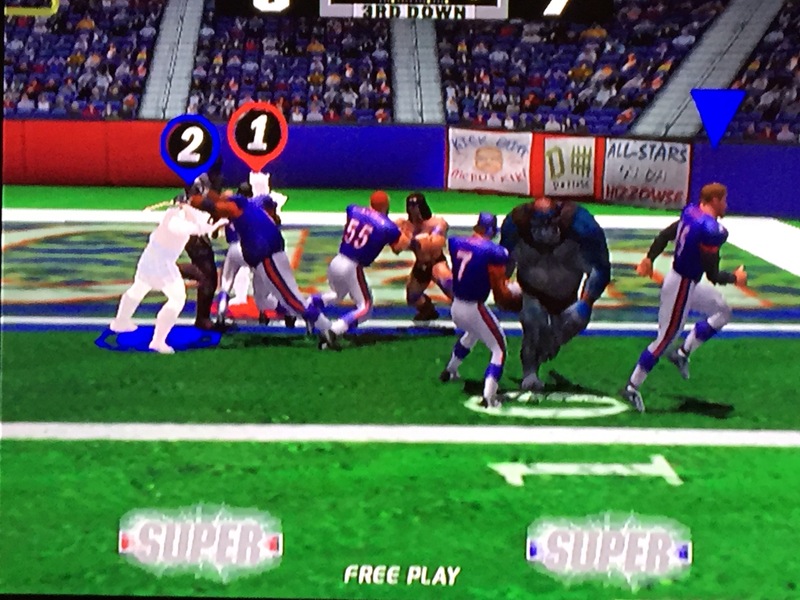 As the QB, if your meter reads SUPER, you can throw an incrediblely quick pass by pressing the button of your receiver plus button 3. Teams: 8 teams are available. As far as I can tell, they all play similarly; however, each has their own unique playbook of nine offensive plays and nine defensive plays, giving some reason to try different teams. Each team has their own unique personality and stadium. 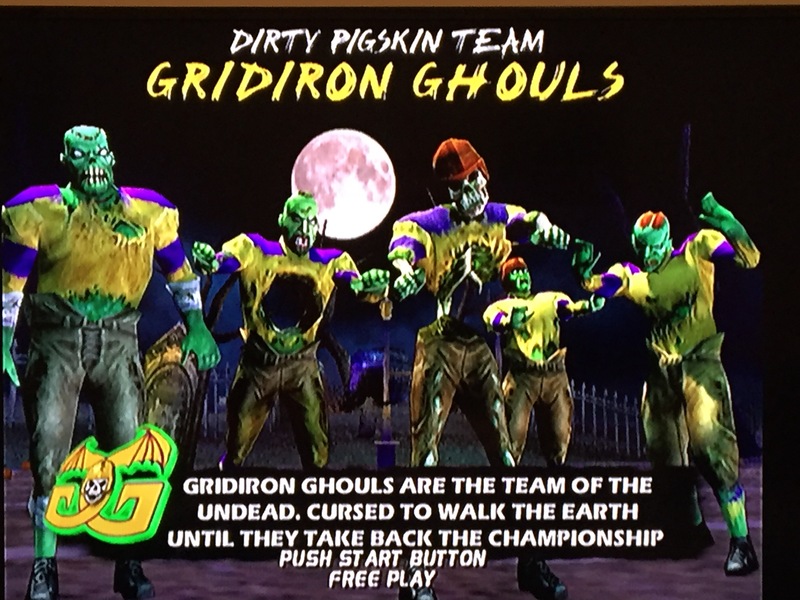 My favorite has to be the Gridiron Ghouls, who play in what appears to be a haunted college campus with a ‘Class of 1903’ banner hanging from a building. Sound Effects: Excellent! Hits are bone crunching! The sound effect for taking off by hitting the turbo button is an exhilarating 0-60 whirr. Music is also unique to each teams’ stadium and awesome. Gameplay & Control: Outstanding. Controlling your character is easy and effective. He or she does exactly what you want. On defense, positioning your player directly in front of receivers is key to getting interceptions or knocking the ball away. It takes a game or two to get things down, particularly learning to use the ‘advanced’ controls, but it’s all really quite simple as an arcade game should be. Options: In the Atomiswave test menu, you can adjust the timer to run Slow, Normal, or Fast. You can set the game to Free Play so you don’t have to pump in Credits, which is great for a game like this. There’s also an option to remove the Bad Girls, the loan female team (I suppose they didn’t want to run into trouble by depicting violence against women?). Saving: The Atomiswave console (motherboard) will save your high scores on high score screens, even if you turn the system off! 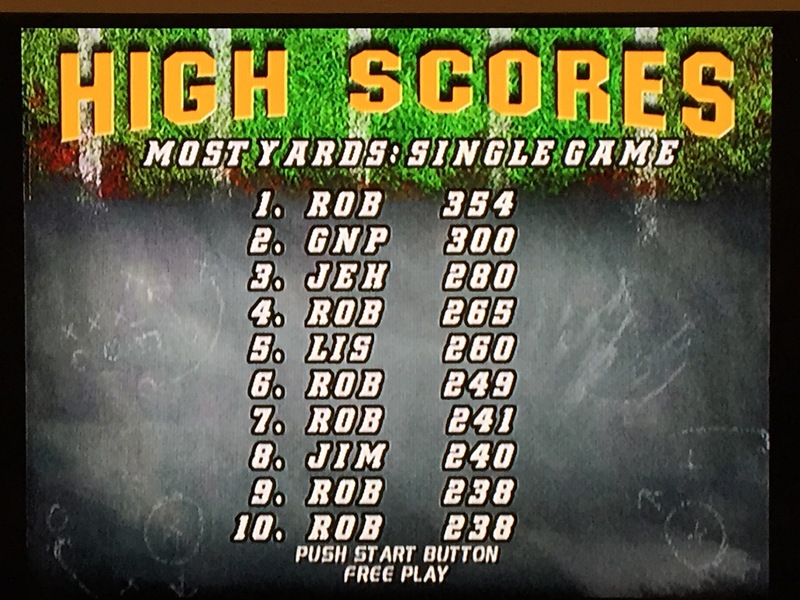 There are multiple high score screens, including Most Yards Per Game, Most Yards Per Season, and Current Champion if you beat the 5th team. 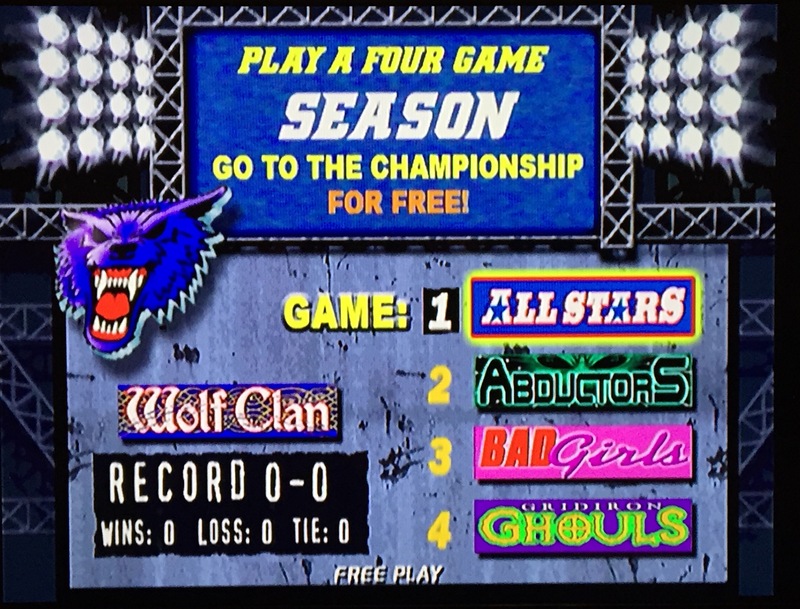 The scores will delete, however, if you insert a new game into the console and turn it on. The Southern Gentleman’s Opinion and Letter Grade: A+. I love football games (see all my other football game reviews! ), but I’ve never really been into 3D style ‘modern’ football games. This one, however, is awesome. Sure, the graphics are a bit blocky. 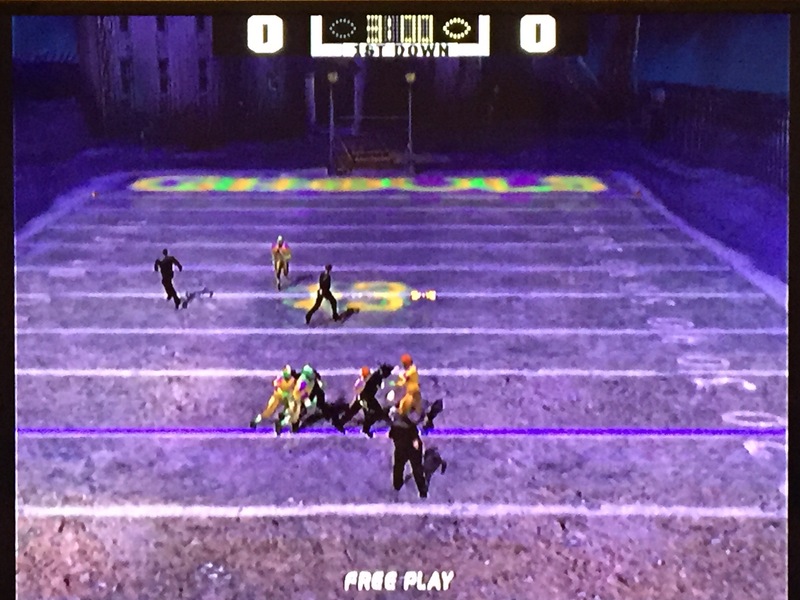 But games are quick (in fact, the whole 5 game season only takes about 20 minutes) co-op is available (something too many arcade football games never allowed) and the action is hard-hitting. The game has an easy learning curve, but even on Easy, getting to 5-0 will take some practice!